With the K5 Child Kit, your 5-year-old will be given the foundation for a lifelong love of reading and learning! The quick success that your kindergartner gains by learning to read phonetically makes reading so much fun! He will soon become an independent reader with stories that keep his interest. The kit includes all of the child’s essential materials—a total of 20 items. Combine this kit with the K5 Parent kit, and your child will become ready for first grade! 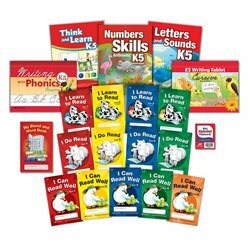 Phonics—Your child will enjoy carefully sequenced activities that will teach him his vowels, consonants, blends, one- and two-vowel words, and special sounds. Abeka phonics has produced thousands of successful readers for more than half a century! Reading—Building on this foundation of phonics, by end of first semester your child will actually be reading little readers! Writing—The continuous flow of cursive writing is much more natural for little ones than the starts and stops of manuscript writing. Research shows that learning cursive writing improves a child’s hand-eye coordination, motor skills, and other brain and memory functions, including increased focus and prolonged attention. Prepare to be amazed with your child’s beautiful writing skills as he learns good technique from the beginning. Numbers—Your child will memorize addition facts up through the number 10 and will be able to identify what numbers come before and after any number from 1 to 100. He will also begin to learn about subtraction, complete one-step story problems with addition, and recognize the largest and smallest numbers from a set of numbers. Please select an option above to see kit contents.